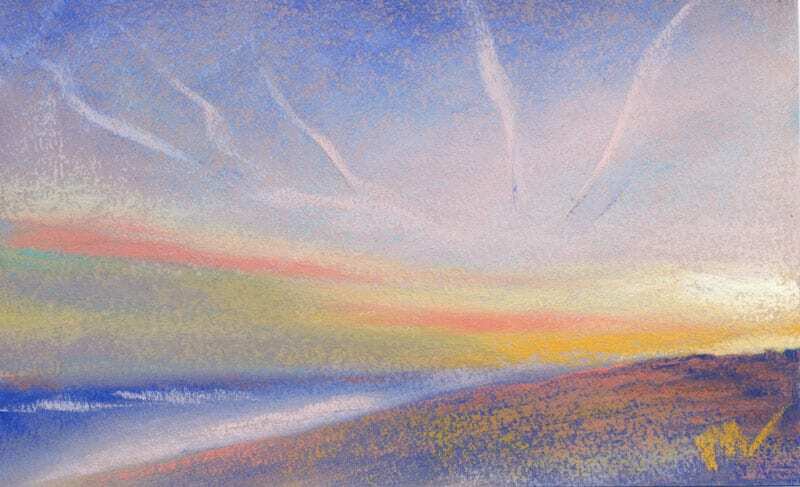 Today’s sky painting is the 4th in a series of 21 that I’m doing as a result of a wonderful mini workshop with Karen Margulis. I remember being on the beach in the late afternoon when I took the picture that this painting is based on. I was there with a few friends and we just didn’t want to leave yet. The sun went down behind us and then the real fireworks started. All the contrails came into high relief against the blue and pink and aqua in the sky. The sand glowed orange. It was wonderful. I’m looking forward to being back in Michigan, hanging out at the beach for sunsets and then painting them, every one that I can. 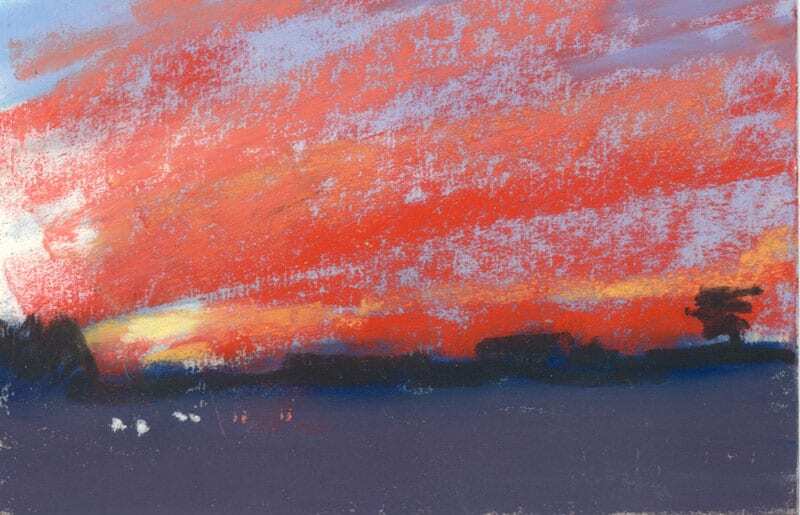 Pink Gloaming, 5×8″ pastel on Canson mi tents paper by Marie Marfia. $75, unframed. Contact me to purchase. 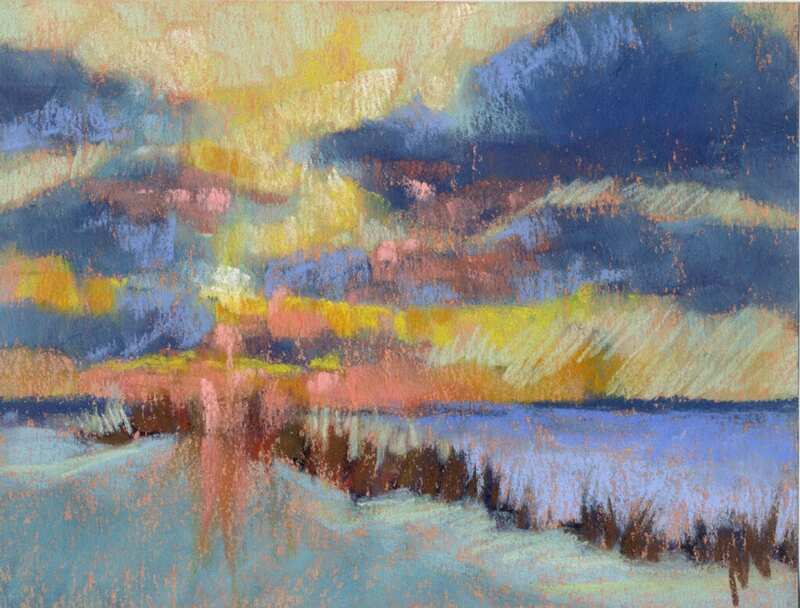 This entry was posted in A pastel a day, Landscape, painting a day, Pastels, seascape, Skies and tagged beach, blue, daily painter, ocean, orange, painting, pastel, pink, shore, sunset on June 9, 2016 by Marie Marfia. It was very intense because it was very short, but well presented and with a lot of good information. Karen challenged the workshop participants to paint 21 skies in the next 21 days, as a way of starting a new, daily painting habit. I already paint every day (well, almost!) and so I’m not too worried about the habit-forming part of the challenge, but oh, the skies! I can totally do that! So here’s Sunday’s sky painting. This is a scene based on a photo my son Nick took while we were driving to karate class. I was blown away by the fiery clouds in the sky, handed Nick my camera and yelled, “Shoot! Shoot!” So he did and I found it again while looking through my photos on my computer in search of appropriate subject matter for the workshop. 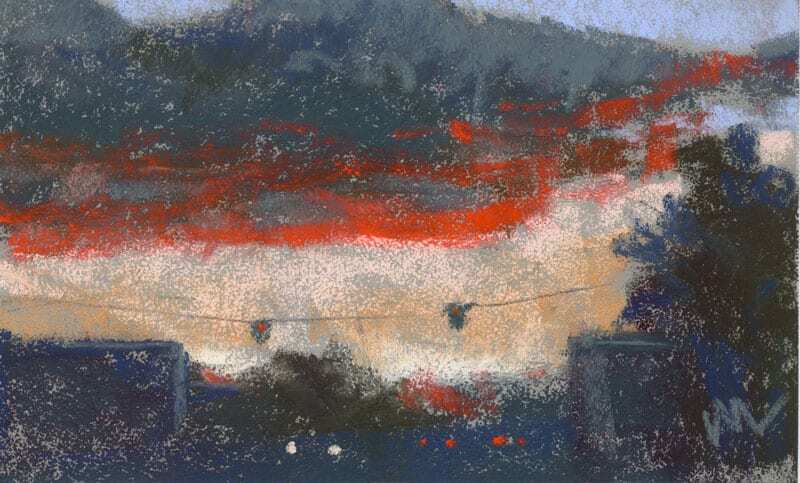 Sunset Drive, 4×6″ pastel on UArt sanded paper by Marie Marfia. $60, unframed. Contact me to purchase. Even though these luscious sunsets are the result of more pollution in the air, which I hate, I still love the colors! I guess that’s a love-hate relationship. I can live with that. This entry was posted in A pastel a day, Landscape, painting a day, Pastels, Skies and tagged art, daily painting, orange, painting, pastel, red, sky, sunset on June 6, 2016 by Marie Marfia.